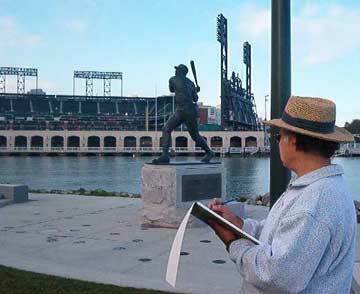 World renowned sport artist, and Bay Area favorite, Armando Delgado was commissioned by KNBR 680, the official radio station of the San Francisco Giants, to create the art in a tribute to McCovey Cove. The art was originally showcased at the FANFEST in San Francisco. "McCovey Cove" is one of San Francisco's most picturesque landmarks located behind AT&T Park, it offers spectacular views of the ballpark and the San Francisco city skyline. Delgado working on sketches for his painting. This watercolor features the Cove filled with boats and other floating crafts of all types waiting for a chance to catch another "blast" from Bonds. The piece features the statue which honors the great hall of famer, Willie McCovey. 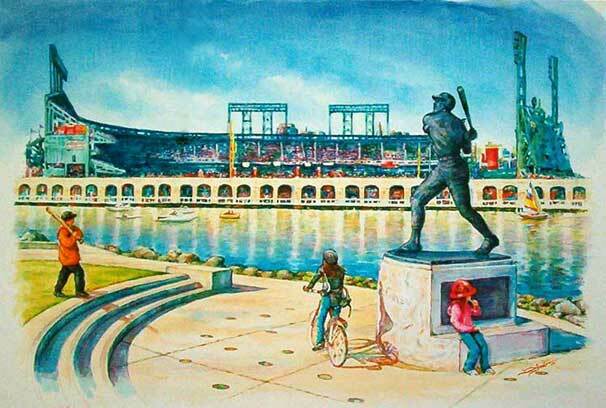 The painting captures the At&T Park during a game day, with children and adults admiring the statue and enjoying the amenities the area offers. "Being from San Francisco and a baseball fan all my life this was a natural. It was a thrill to capture on paper, the serenity and excitement this wonderful location offers, Delgado. $129 Professionally Frame "McCovey Cove" Poster-Includes two mats. wooden frame and comes ready to display. Shipping is included. To address your inquiries regarding the lithographs and or any other of Delgado's work, click here.